The Living Atlas of the World, included with ArcGIS, gives you access to maps and layers from Esri, Esri partners, and thousands of ArcGIS users from around the world. These maps and layers cover a diversity of geographies from global to national to local and topics that range from land cover to live traffic. The Living Atlas is actively curated by Esri staff members who identify, select, and organize the most useful maps and layers so they are easily accessed. It is organized into categories: Imagery, Basemaps, Community Maps, People (various aspects of human geography), the Earth (e.g., landforms, elevation, geology, soils, oceans, climate, natural hazards), and Life (e.g., ecoregions, wetlands, vegetation, protected areas). The imagery collection is one of the richest and most popular. It includes basemap, multispectral, temporal, and event imagery layers that support a variety of maps, applications, and use cases. NAIP high-resolution (1 m) imagery, which is refreshed on a three-year cycle, is available for the continental United States. The imagery available through ArcGIS is intended to support a range of use cases for visualization and analysis, whether you are studying global climate change, performing vegetation analysis, or comparing potential site locations. 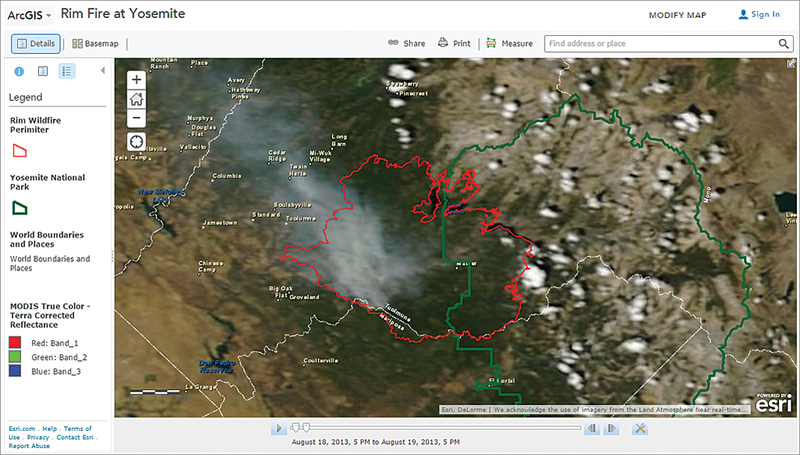 Global scale imagery is supplied to ArcGIS Online from two sources. The global 250 m (i.e., meter per pixel) Moderate-Resolution Imaging Spectroradiometer (MODIS) imagery from the National Aeronautics and Space Administration (NASA) is updated in its entirety on a daily basis. Global 15–30 m Landsat 8 imagery from the United States Geological Survey (USGS) is updated every 16 days. The best scenes in each update are automatically selected and archived. Higher-resolution imagery is available for a large portion of the earth's landmass. Imagery at 1m resolution from the United States Department of Agriculture Farm (USFA) Service Agency (FSA) National Agriculture Imagery Program (NAIP) is available for the continental United States. Each state is updated at least every three years. This imagery supplements the World Imagery basemap in ArcGIS Online, which includes 15 m or 2.5 m imagery for the world and high-resolution imagery of 1 m or better that covers approximately three- quarters of the world's landmass and more than 90 percent of its population. High-resolution imagery in the World Imagery basemap comes from a variety of commercial and contributor sources. 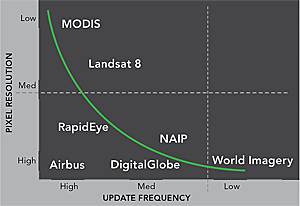 Commercial sources include DigitalGlobe and Airbus. Contributor sources include jurisdictions at various levels such as the country of Denmark, state of Maine, and the city of Berlin. Esri selects and publishes the best available imagery based on image currency, resolution, and quality. Event imagery is the latest available imagery both before and immediately after major events such as the Rim Fire at Yosemite in 2013. If the image layers already available in ArcGIS Online don't meet your specific requirements, premium image layer packages can be licensed through ArcGIS Marketplace. These premium packages include imagery from DigitalGlobe, RapidEye, and a unique new offering from Airbus that lets you select individual scenes from its growing archive of 0.5 m imagery or task a new scene to be acquired in a time frame you specify. 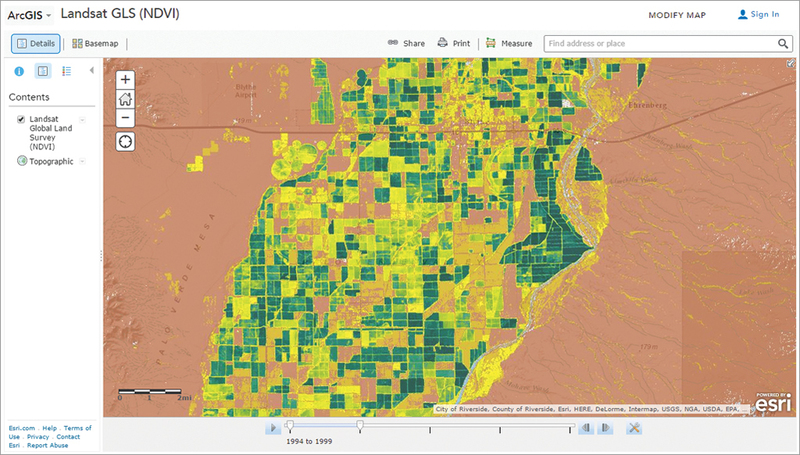 These descriptions summarize key imagery offerings currently available through ArcGIS Online. This popular basemap provides 1 m or higher-resolution satellite and aerial imagery for many parts of the world and lower-resolution satellite imagery worldwide. The map includes 15 m TerraColor imagery at small- and mid-scales and 2.5 m SPOTMaps Imagery for the world. The map features 0.3 m resolution imagery in the continental United States and parts of western Europe supplied by DigitalGlobe. Additional DigitalGlobe submeter imagery is available for portions of South America, eastern Europe, India, Japan, the Middle East and North Africa, South Africa, Australia, and New Zealand. Submeter Pléiades imagery is available in select urban areas globally. Built with the best available data from a variety of sources, the World Imagery basemap includes local authoritative data provided by many users through the Esri Community Maps Program. It is freely available to all ArcGIS users. New Landsat 8 scenes are collected every 16 days. Esri-hosted maps and layers are updated on a daily basis with the latest and best scenes. Maps and layers built using NAIP high-resolution (1 m) imagery for the United States provide access to the most recent NAIP imagery for each state, which is based on a three-year cycle (currently 2010–2013). It is updated annually as new imagery is made available. This imagery is published in four bands (RGB and near infrared) where available with the option to display the imagery as false color to show the infrared (IR) band or display the Normalized Difference Vegetation Index (NDVI), which shows the relative biomass of an area. NAIP imagery is available to users with an ArcGIS Online subscription, but its use accrues no credit fee. Maps and layers featuring recent Landsat 8 scenes cover the landmass of the world and are used for visual interpretation. Landsat 8 collects new scenes for each location on earth every 16 days. Esri-hosted maps and layers are updated on a daily basis with the latest and best scenes (i.e., those with limited cloud cover) from the USGS. Landsat 8 imagery is available to users with an ArcGIS Online subscription, but its use accrues no credit fees. ArcGIS Online makes a wide range of imagery that is available in range of resolutions and undate cycles. 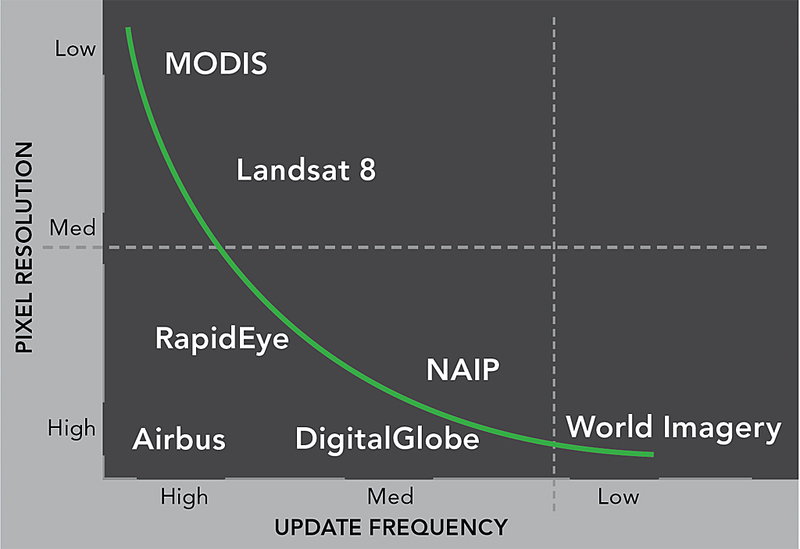 MODIS maps and layers feature 250 m resolution imagery for the world is updated on a daily basis. These services provide access to a subset of the NASA Global Imagery Browse Services (GIBS), a set of standard services for delivering global, full-resolution satellite imagery. 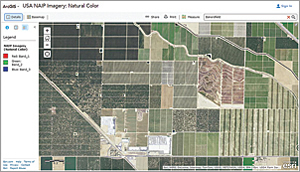 These maps and layers are freely available to all ArcGIS users. Get familiar with the imagery layers available through the Living Atlas by visiting the Living Atlas Imagery: Gallery. If you have more current or higher-resolution imagery you believe would improve the World Imagery basemap, visit goto.arcgisonline.com/community-maps or e-mail communitymaps@esri.com.